In the eastern pre-dawn sky on the morning of Wednesday, December 13, the waning crescent moon will sit less than 5 degrees above dim reddish Mars. Both objects will fit within the field of view of binoculars (red circle). Watch a waxing crescent moon pass the dim Red Planet during the early hours of Dec. 13 and then brilliant Jupiter the following morning, as an eye-catching show to accompany the Geminid meteor shower. It is quite likely that more than the usual complement of people will go outside prior to the break of dawn this Wednesday (Dec. 13) and Thursday (Dec. 14) to try and catch a glimpse of this year's performance of the Geminid meteor shower. And while they're waiting to catch sight of a meteor darting across the sky, they will also be looking at a sky which, at around 5:30 a.m. local time, is actually a preview of what the sky will look like in mid or late April, at around 10 p.m. When April finally arrives with the return of forsythia, magnolia blossoms and the sweet smell of spring, these same stars will adorn the late evening sky. They will all be in their exact same positions as now, save for three objects: the moon and two bright planets, Mars and Jupiter. As even the earliest stargazers knew, these three have the freedom to move . . . from place to place and time to time in the night sky. But assuming you plan to be outside on Wednesday and Thursday morning, here is what you'll see about 90 minutes before sunrise. In the eastern pre-dawn sky on the morning of Thursday, December 14, the old crescent moon will sit about 4 degrees above bright Jupiter and 3 degrees to the upper right of the large asteroid Vesta. All three objects will fit within the field of view of binoculars (red circle). On Wednesday, you'll see a waning crescent moon about one-third of the way up in the southeast sky, roughly 20 percent illuminated by the sun. If you're lucky, you might spot Earthshine — a ghostly, grey-blue glow across the dark terrain of a slender crescent moon. This effect is created by sunlight reflected from off the clouds and oceans of our planet onto the moon. Some regard it as one of the most beautiful sights in the sky. You'll also notice an orange-yellow "star" below the waning crescent moon this morning. That's Mars. Currently in the zodiacal constellation of Virgo, on the 21st it will move into Libra. Each morning brings us a little closer to Mars, because Earth is slowly gaining on it as both circle the sun. As we catch up to Mars, we'll see it grow a little brighter in our sky and rise a little earlier every day. It will continue to brighten until next July, when it will be at opposition, and we'll pass between it and the sun. At that time, Mars will appear more than 60 times brighter than it appears now! 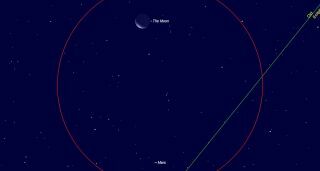 On Thursday morning (Dec. 14), the moon will have slimmed down to a 13 percent-illuminated crescent. Predawn skywatchers will no doubt also take notice of Jupiter below it, shining like a steady, white light. It clears the horizon about 3 1/4 hours before the sun and at dawn's initial gleam provides a fine target for telescopes of all sizes. To sum up, there is a lot to look at this week. So arise early, bundle up and enjoy the view!